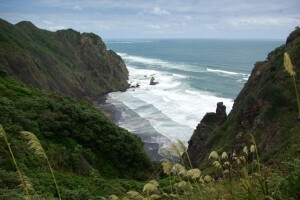 Mercer Bay is to the south of the Piha between The Gap and Karekare. It sits at the bottom of precipitous cliffs, the highest in the Auckland region in this area,Â and access down these is only for the brave and fit. It can also be accessed from the seawards by swimming but once again, only the intrepid would try this in very calm seas. My mother told me about rowing around to Mercer Bay in the surf boat from Piha and thenÂ she swam in to the beach, but she was a good swimmer, and swam into her 80s! The name comes from Andrew Mercer, a slater, who was given the area as a Crown Grant in 1866. This was the short straw as far as grants were concerned, as it was steep, remote and windswept. He didn’t last there long. After this it was farmed by the Lovetts and the Usshers. In Maori tradition the area was called Te Unuhanga o Rangitoto and this refers to a feat of Tiriwa, the most famous chieftain of the fairskinned people who originally inhabited the Waitakare Ranges and who possessed supernatural powers. At a gathering of tohunga at the hill to the north of the bay, known as Te Ahua, he demonstrated his powers by moving Rangitoto, a rock that was obstructing the view of the Manukau Bar. Lifting the moutain on his shoulders, he strode over to the Waitemata Harbour, but when the cold water hit his thighs, he gasped and dropped his load in the position when Rangitoto now stands. The area has a very rich cultural history with occupation over a long period. Soon a pou will be installed at the place by Te Kawerau a Maki. The Mercer Bay area and Te Ahua Point are on regional parkland and are reached by the Mercer Bay Loop Track which leads off the end of Log Race Race. 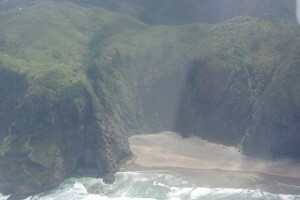 There are various marvellous lookout points along the track where the cliffs reach 700 feet high. Recently a platform has been built at Te Ahua Point – not for people with vertigo! This area at the end ofÂ Log Race RaceÂ was once the location of a WW2 Radar Station, positioned here for security purposes because of the very high cliffs. During the 1940s, it was the scene of some very famous experiments where radio stars were identified through the pioneering work of John Bolton and Gordon Stanley.